Black walnut trees are nice. They grow a bit slowly but are nice sized in ten years with a wide canopy. They are long lived. They leave you picking up black walnuts. That is the main reason many people don’t like having the trees in their yards. A big tree drops a lot of nuts beginning in late August and ending in late October. 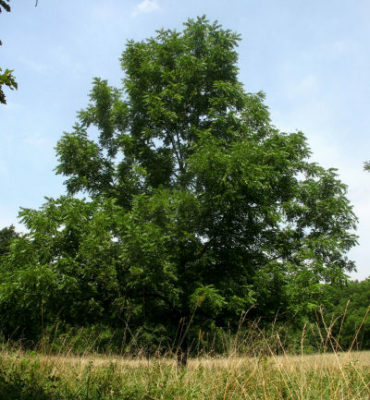 This is a younger black walnut tree. As it gets older the top will round out more. Walnuts are borne mostly on twig tips. And there are a lot of twigs. Stores carry walnut meats. These are from English walnuts which like warmer areas than the Ozarks. The nut meats do taste good, but not as good as black walnut meats. Black walnut meats have richer flavor. They are spicier. They make their presence known in whatever they are in. We have four big trees around the barn area. The nuts are falling. We can ignore them or we can begin picking up black walnuts. The case for ignoring them isn’t very good. These can be almost three inches across the hulls. They are hard to begin with and roll under your feet. Small wasps lay eggs in the hulls turning them into a black, gooey mess as the larvae eat the flesh. 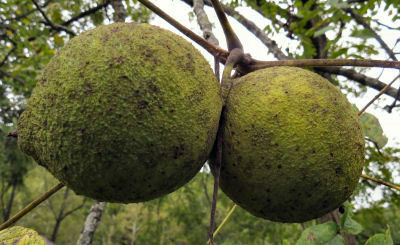 Most black walnuts hang in pairs or threes on smaller branches. They are heavy and branches droop down with the weight. The nuts themselves are extremely hard. Lawnmower blades end up with nicks mowing over them. 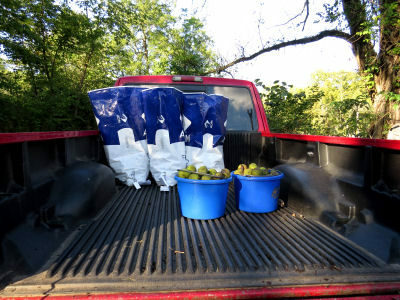 The case for picking up black walnuts is better. It removes the risks of wrenching an ankle. It saves the lawnmower blade. They are good to eat, although difficult to crack open. (It takes a special nut cracker or a heavy hammer.) And the nuts are saleable. Our local feed store hulls and buys black walnuts for around twelve dollars a hulled hundred weight. The price varies over the month of October, higher the first week and dropping over the month. I use the plastic feed bags to gather nuts in. It takes about six bags to net a hundred pounds of hulled nuts. I usually gather the nuts in old two gallon buckets. It takes thirty nuts or more to fill a bucket and five buckets to fill a sack. Black walnuts deteriorate into a black, gooey mess in a week or so. Plastic feed sacks work well. These sacks aren’t full yet. Once they are full, I tie them off with baling twine. It’s possible to put five sacks across, two rows, then pile four flat on top and two on top of those. Another two rows across and pile. I won’t do that this year as I won’t pick up that many. Still, it would be nice. That is another drawback to picking up black walnuts to sell. It takes a lot of walnuts to make any money. It takes a lot of time. One year I gathered a thousand pounds of black walnuts. Not now. I don’t have the time. Now I mostly go picking up black walnuts because I hate stepping on them. Last year I sold three hundred pounds. This year I have one sack filled and part of another one and more on the ground to pick up. This entry was posted in High Reaches and tagged black walnuts, picking up and selling black walnuts on September 26, 2018 by [email protected].